Bond fan Aedy shaken and stirred! 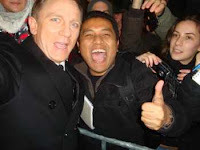 5 Nov – As the cinemagoing portion of the nation braces itself for the general release of "Quantum Of Solace" tomorrow, a Malaysian student residing in Germany got the chance of a lifetime when Daniel Craig spontaneously took his camera from him and snapped a picture of them together at the Berlin premiere on 3 November 2008. An ecstatic Aedy Fadly Ramli, 32, sent Cinema Online the priceless picture and said: "I am the luckiest man in Berlin that night I think. He came to me and asked about my camera. Then, he just took it and snapped a picture of us! I also managed to get his autograph." "Quantum Of Solace" is this weekend's main draw at the cinemas, with no other movies opening, except for Hindi movie "EMI" on November 7. The 22nd Bond movie goes on general release tomorrow at around 80 cinemas nationwide and tickets are already available at most cinemas.